The 1997 was particularly hilly. 1996 Giro champion Pavel Tonkov took the lead and focused most of his attention on Luc Leblanc. When the race hit the high mountains, while Tonkov was watching Leblanc, Ivan Gotti rode off and to take the lead, which he was able to keep to the end. Italian hope Marco Pantani crashed out of the Giro but recovered in time to get third in the Tour de France. Not having a reliable test for EPO, the UCI set 50 percent as the ceiling for a rider’s hematocrit. A finding of more than 50 percent was not to be considered a doping positive, because at the time there was no reliable way to detect synthetic EPO and therefore it couldn’t be proven to be the cause of a high hematocrit. A rider found to be over the 50 percent threshold was declared unhealthy and immediately suspended for 15 days, which would, the line went, allow him to become well enough to resume racing. The ruling had a perverse effect. Any rider hoping to be competitive had to dope himself up to the 50 percent threshold. Conconi takes credit for suggesting this rule to the UCI, but he had actually advanced a 54 percent hematocrit as an appropriate upper level. Fifty percent was settled on because it was thought riders would be less likely to die in their sleep. Looking back at this, it all seems crazy. At the Tour of Romandie, Chiappucci was snared by the limit when he was found with a 50.8 percent hematocrit. The two-week suspension kept him out of the Giro. Pantani’s spring program didn’t shrink from hard racing and even took him to the brutal northern European Classics, where he did well enough, including a fifth in the Flèche Wallonne and good placings in other races. Pulling out of the Tour of Romandie, he complained that his form was still lagging and that he would never again be the rider he had been two years before. He said he had tried to race too much too soon after his accident and was circumspect about his own prospects. 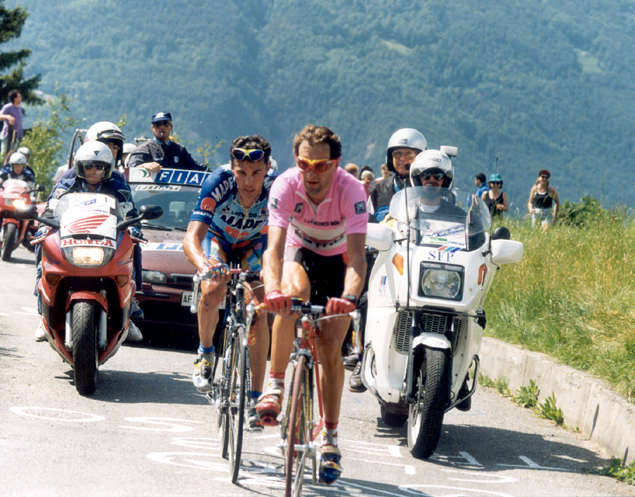 The 1997 Giro looked like a climber’s race. There were two time trials totaling 58 kilometers, the first one in stage three having a hard ascent at the end. 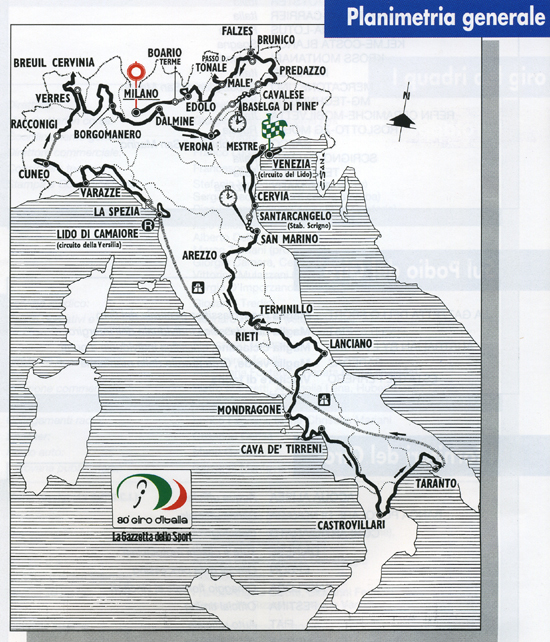 Four stages with hilltop finishes, including a devastatingly difficult penultimate stage in the mountains, made it certain that a rouleur would not be triumphant in Milan. No prologue time trial was scheduled; the first stage would be sixteen laps up and down Venice’s Lido beach. Because the Giro organization had botched the sale of the television rights by demanding insanely high prices, large areas of Europe either didn’t get the 1997 Giro at all or had to pay for it. Also, many riders with Tour ambitions decided to avoid tiring themselves in such a hard race. The result was a rather attenuated field with none of the world’s top-ten rated riders planning to contest la corsa rosa. There was talk that the status of the Giro had fallen even below that of the Tour of Switzerland. Even so, the race still had plenty of good riders. Tonkov had won the Tour of Romandie. Enrico Zaina, who earlier had been Chiappucci’s gregario, was now free to race on his own account since Chiappucci was suspended. Frenchman Luc Leblanc was in good shape, having won the Giro del Trentino. The consensus was that if Pantani had returned to good form, the race would be between him and Tonkov. Mario Cipollini won the first two stages. 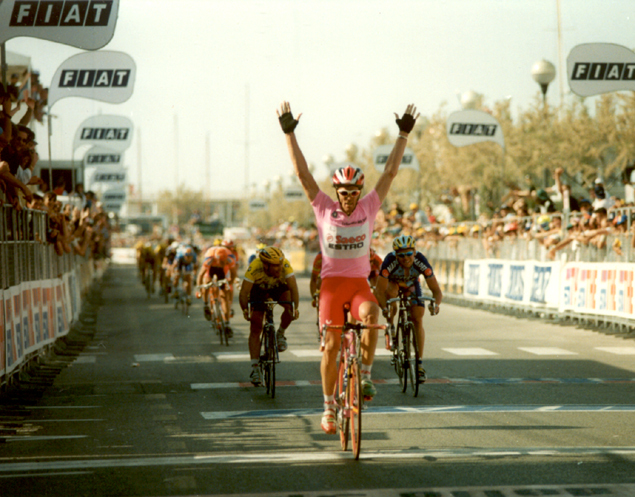 His leadout train lost control of the race in the final kilometers of the first stage, yet Cipollini bored through a nearly nonexistent hole next to the barriers and emerged the winner of the first Pink Jersey. The next day he led the sprint out from far back and no one could come around him. Cipollini’s days in pink had to come to an end, and with the uphill time trial in San Marino, they ended immediately: the course’s eleven-percent gradient spelled certain doom for pure sprinters. Tonkov won the stage with Evgeni Berzin second, 21 seconds slower. Tonkov thought Berzin would have turned in a better time if he hadn’t been over-geared in the first half of the course. Pantani did well enough, losing 1 minute 23 seconds. Tonkov was now the leader and Berzin was second, a single second behind. So far the Giro had enjoyed lovely weather. In stage five, when the race arrived in Abruzzo with its hilltop finish at Terminillo, the rain came. The pack was all together for the start of the fifteen-kilometer, eight-percent grade and Tonkov had his team keep the pace warm during the first kilometers of the ascent. But soon Pantani’s Mercatone Uno men decided the speed had to be increased and increase it they did. That effort had two surprising victims, Berzin (who got the hunger knock) and Ugrumov. With about three kilometers to go the sun came out. Several riders attempted getaways, but Tonkov easily rode up to each attacking rider, including Pantani. His neutralizing efforts looked almost effortless, usually without his even getting out of the saddle. Going southwest without any appreciable change to the standings, the Giro arrived on the Amalfi Road on the southern Italian coast. It was a piano day and while the peloton cruised down the Tyrrhenian coast, a group of non-contenders was allowed their day in the sun and finished fourteen minutes ahead of the disinterested pack. But the day profoundly affected the Giro’s outcome in another way; thirty kilometers before the finish Pantani hit a cat while descending the Valico di Chiunzi. He didn’t break any bones, but after getting badly bruised and losing twelve minutes, he abandoned. After going all the way to the heel of Italy, the peloton spent its rest day transferring up to the Tuscan coast. The order of business when the Giro resumed was to boot four riders from the race, none of whom were in contention for the Overall, for excessive hematocrits. Stage fourteen took the riders almost due north, sliding by the east side of Turin on the way to the Alps. It ended with a 2,100-meter-high sort-of mountaintop finish at Cervinia, on the Italian side of the Matterhorn. After they reached the summit, they had a two-kilometer downhill rush to the line. On the penultimate climb, the San Pantaleon, things broke wide open. A small group of riders including Axel Merckx (Eddy Merckx’s son) had been off the front for a while. Out of nowhere Ivan Gotti exploded from what was left of the peloton. Stefano Garzelli of Mercatone Uno was the only rider to mark the move. Gotti bridged up to the Merckx group with astonishing ease while Tonkov did nothing, keeping his attention on his bête noire, Leblanc. Still Tonkov did nothing and Leblanc, not wanting to hand the Giro over to Gotti through inaction, led the chase. The Gotti group went over the Pantaleon 23 seconds ahead of the maglia rosa. The Gotti group flew down the Pantaleon like madmen and by they time they got themselves organized on the way to Cervinia, they had enlarged their advantage to 64 seconds. Gotti, knowing the stakes involved, singlehandedly dragged his group up the hill. With six kilometers to go the race had turned into an exciting pursuit. Up front Gotti was pounding away for all he was worth with Nicola Miceli hanging onto his wheel. One hundred seconds back, feeling the Giro slipping from his grasp, Tonkov had only Leonardo Piepoli for company while Leblanc, unable to maintain the white-hot pace, was nowhere to be seen. Tonkov had gambled and lost. Leblanc was not Tonkov’s main challenger, it was Gotti. Gotti’s lead shouldn’t have been a surprise. 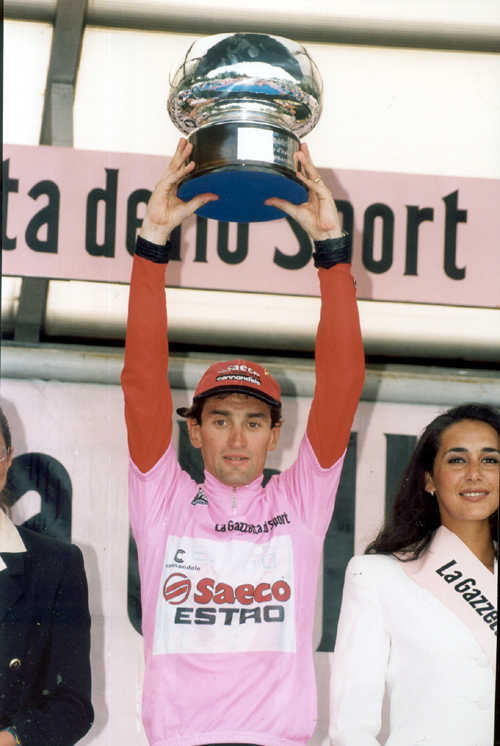 He had been second in the 1990 Girobio, fifth in the 1995 Tour (including two days in yellow) and fifth in the 1996 Giro. Yet he had not been invited to the Giro presentation with the other contenders, a fact that was clearly on his mind when he spoke to the press after the stage, feeling he had been unjustly forgotten. They certainly knew about him now. The Giro turned east for its appointment with what were intended to be the deciding stages: a 40-kilometer time trial followed by three days in the Dolomites. Normally, since Tonkov was the superior time trialist, Gotti’s lead might have been in danger. But just before the stage start the judges wouldn’t let Tonkov ride his time trial bike because it had a projection over the rear wheel the officials deemed an illegal fairing. Tonkov switched to his back-up bike, one he didn’t really like. The result? Tonkov was able to take back only fourteen seconds. The bike switch might actually have been a blessing because the hard-to-handle specialty time trial bikes proved to be lots of trouble on the technical, high-speed course. Both Alexandr Shefer (now lying in fourth place) and Leblanc were among those who crashed hard. Both riders abandoned. At 5:30 in the morning, before the start of stage nineteen, NAS raided the hotel rooms of the MG-Technogym riders and found a large cache of dope. Among the finds were twenty boxes of anabolic steroids, three boxes of growth hormones and of course, EPO. At first team director Ferretti said the drugs were for his personal use, to help him improve his sexual performance. As we say out here in the Ozarks, that dog don’t hunt. It was later admitted that the drugs were for the riders’ use. The team left town that afternoon and the sponsors quit the sport at the end of the year. Rain and six major climbs greeted the riders at the start of stage nineteen. Just listing what the peloton had to get over during its 222-kilometer Calvary is tiring: the Pinei, Sella, Pordoi, Campolongo, Furcia and the Riomolino with a final uphill grind to Falzes. Tonkov, who crashed and remounted on the Campolongo, could not contain Gotti. On the Riomolino, Gotti, who had Leblanc teammate Giuseppe Guerini for company, had been hoping he would be able to work with and help Leblanc as a foil to Tonkov. With Leblanc now out, Guerini was given the go-ahead to work with Gotti and try to improve his own standing, then sixth place. Gotti was able to extend his lead by another 55 seconds. The stage nineteen seven-hour ordeal must have been enough. Even with stage twenty’s finish at the top of the Tonale, Tonkov made a few half-half hearted attacks which Gotti, content to merely stay with Tonkov, easily handled. A group of non-contenders was allowed to come in ten minutes ahead of the maglia rosa. Now it was down to just one last mountain stage, with three hard passes, including the Mortirolo. Tired or not, Tonkov’s Mapei team wasn’t going down without a fight. They sent Gianni Bugno up ahead and then set a pace so hot that eventually nearly everyone was dropped. It was down to just Gotti and Tonkov as they caught Bugno on the Mortirolo. The gradient rose to eighteen percent and on a switchback, a motorcycle fell over in front of Bugno. Now it was Gotti and Tonkov, the two best riders, riding side by side on the Mortirolo, one of the hardest ascents in cycling. Gotti tried several times to drop Tonkov, but the Russian stayed with him. It was thrilling duel. Finally Gotti took the front and it looked like Tonkov had thrown in the towel, but two kilometers from the summit there was a surprise. Wladimir Belli closed up to the two leaders and then led for the rest of the climb through a sea of fans lining the narrow road. The tifosi were sure an Italian was going to win the Giro and they weren’t going to miss it. Tonkov won the three-up sprint, but with only the final ride into Milan remaining, the Giro was Gotti’s. Pantani restarted his season at the Tour of Switzerland, which he abandoned. His Tour de France was a triumph for a man who was a shattered wreck little more than a year before. He came in third to Jan Ullrich, whom many thought would go on winning Grand Tours for a decade, and Richard Virenque, who soon would be at the center of cycling’s greatest doping scandal. Pantani’s Tour was particularly memorable because of his two spectacular mountain stage wins. By now Pantani had taken on the persona associated with his best years; he shaved his head and took to wearing a bandanna. He had become Il Pirata.